Phenomenon of adsorption-induced deformation attracted recently a considerable attention owing to its relevance to practical problems of mechanical stability and integrity of novel nanoporous materials and their adsorption properties. Guest molecules adsorbed in nanopores cause a substantial stress in the host matrix leading to its contraction or swelling depending on the specifics of host-guest interactions. Although various experimental manifestations of adsorption-induced deformation have been known for a long time since Leonardo da Vinci’s studies of water sorption on human hair, a rigorous theoretical description of this phenomenon is lacking. I will present a general thermodynamic approach to predicting adsorption stress and respective deformation in various microporous and mesoporous materials based on molecular models of adsorption within poroelastic nanoscale confinements. Examples include metal-organic frameworks, zeolites, mesoporous crystals, hierarchical micro-mesoporous carbons and meso-macroporous silicas [1-12]. As a topical practical application, I will also discuss the deformation of coal during CO2 sequestration at geological conditions [7,8]. C. Balzer, A.M. Waag, S. Gehret, G. Reichenauer, R. Morak, L. Ludescher, F. Putz, N. Hüsing, O. Paris, N. Bernstein, G.Y. Gor, and A.V. Neimark, Adsorption-Induced Deformation of Hierarchically Structured Mesoporous Silica - Effect of Pore-Level Anisotropy, Langmuir, 2017, 33, 559. P. Kowalczyk, C. Balzer, G. Reichenauer, A.P. Terzyk, P.A. Gauden, and A V. Neimark, - Using in-situ Adsorption Dilatometry for Assessment of Micropore Size Distribution in Monolithic Carbons, Carbon, 2016, V. 103, p. 263-272. F.-X. Coudert, A.H. Fuchs, and A.V. Neimark, Adsorption Deformation of Microporous Composites, Dalton Transactions, 2016, 45, 4136. Hae Sung Cho, Hexiang Deng, Keiichi Miyasaka, Zhiyue Dong, Minhyung Cho, Alexander V. Neimark, Jeung Ku Kang, Omar M. Yaghi, and Osamu Terasaki, - Extra adsorption and adsorbate superlattice formation in metal-organic frameworks, Nature, 2015, V.527, p.503-508. F.-X. Coudert, A H. Fuchs, A. Boutin, and A.V. Neimark, Adsorption Deformation and Structural Transitions in Metal-Organic Frameworks: From the Unit Cell to the Crystal, JPC Letters, 2013, 4, 3198. A.V. Neimark, F.X. Coudert, C. Triguero, A. Boutin, A. H. Fuchs, I. Beurroies, and R. Denoyel - Structural Transitions in MIL-53 (Cr): View from Outside and Inside, Langmuir, 2011, 27, p. 4734. K. Yang, X. Lu, Y. Lin, and A.V. Neimark, - Effects of coal deformation upon CO2 adsorption and sequestration, Journal of Geophysical Research – Solid Earth, 2011, V.116, B08212. K. Yang, X. Lu, Y. Lin, and A.V. Neimark, - Deformation of coal induced by methane adsorption at geological conditions, Energy&Fuel, 2010, V.24, p.5955–5964. G. Yu. Gor and A.V. Neimark, - Adsorption-Induced Deformation of Mesoporous Solids, Langmuir, 2010, V.26, p.13021–13027. a.V. Neimark, F.X. Coudert, A. Boutin, and A. H. Fuchs, - Stress-based model for the breathing of metal–organic frameworks, Journal Physical Chemistry Letters, 2010, V.1, p.445–449. P. Kowalczyk, A. Ciach, and A.V. Neimark, - Adsorption-induced deformation of microporous carbons: pore size distribution effect, Langmuir, 2008, V. 24, 6603-6608. P.I. Ravikovitch and A. V. Neimark, - Density Functional Theory Model of Adsorption Deformation, Langmuir, 2006, V.22, 11171-11179. Dr. Alexander V. Neimark is a Distinguished Professor of Chemical and Biochemical Engineering at Rutgers University. He received his doctor of science degree at the Moscow State University, and then worked at the Institute of Physical Chemistry of Russian Academy of Sciences. Prior to joining Rutgers in 2006, he held visiting positions at Mainz University (Germany), CNRS (France), and Yale University (USA) and then served as Research Director of the Textile Research Institute TRI/Princeton in 1996-2006. He is a recipient of a number of national and international awards and honored appointments, including Guggenheim Fellow, Blaise Pascal International Chair, Humboldt Fellow, Fellow of American Institute of Chemical Engineers, and Distinguished Visiting Fellow of the Royal Academy of Engineering. He is currently a Leverhulme Visiting Professor at University College London. 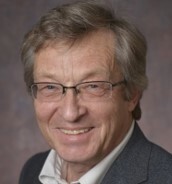 Dr. Neimark research interests include thermodynamics, statistical mechanics, molecular modeling, design and characterization of nanoporous solids and self-assembled soft matterials.. He published 250+ scientific papers, named a highly cited scientist by ICI, citation index h=63.